Behaviourism was a dominant field in psychology from around 1913, when John Watson published Psychology as the Behaviourist Sees it, to around the 1970s when cognitive psychology began to dominate. One of the biggest and most important advances made by the behaviourists was Operant Conditioning (formerly called Instrumental Conditioning). Simply put, operant conditioning suggests that organisms, including humans, learn from rewards and punishments. Organisms will continue to perform behaviours which they are rewarded for and they will cease to perform behaviours which they are punished for. This is a very simple idea of operant conditioning, but it will suffice for helping you understand this study, which considers how children’s adherence to medication. It is highly recommended that you read About Behaviorism by B.F. Skinner, as it will enable you to have a broader understanding of behaviourism than is present here. Medical professionals and psychologists have tried to used classical conditioning and operant conditioning to increase adherence to medication in the past. The Funhaler as used in the Chaney et al (2004) study. The aim of Chaney et al. 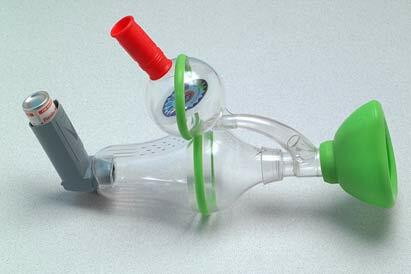 (2004) to show the use of a novel asthma spacer device, the ‘Funhaler’, which incorporates incentive toys isolated from the main inspiratory circuit by a valve, whilst not compromising drug delivery, can provide positive reinforcement which leads to improved adherence in young asthmatics. Chaney et al. (2004) used a field experiment and a repeated measures design. Whether the child used the novel ‘Funhaler’, as seen above. Dependent variable: The children’s adherence to their medical regime was the measured variable. 32 asthmatic children (22 male, 10 female). Age range 1.5 – 6 years, mean age 3.2 years. Average duration of asthma 2.2 years. Informal consent was solicited from the children’s parents, who also participated in the study by completing a questionnaire and helping with the administration of the asthma medication. Firstly, a comparison was made between the aerosol output of the standard/small volume spacer device (235ml Breath-a-Tech) and the 225ml Funhaler. Overall no significant differences were observed. The comparison was therefore complementary, indicating that the use of a Funhaler rather than a standard inhaler does not compromise drug delivery. This is an important control measure implemented by the researchers as differences in the amount of air output from the different inhalers could have caused any differences in adherence. As this control measure was implemented, we can be sure that the differences found were not due to differences in aerosol output. As part of this process, participants were approached by the researcher at home initially before the Funhaler was mentioned and were interviewed with a questionnaire on their existing use of the inhaler. Then they were give the Funhaler for two weeks and reported over the phone on an ad hoc basis to take snapshots of whether they had used the Funhaler the previous day. Matched questionnaires were competed (by parents) after sequential use of the Breath-a-Tech inhaler and the Funhaler. After sequential use of the Breath-a-Tech inhaler and the Funhaler they were then visited again by the researcher and parents were interviewed and completed the matched questionnaires. Data collected from the self-report related to how easy each device was to use, compliance of parents and children, and treatment attitudes. Furthermore, during the course of the study each parent was called at random to find out whether they had attempted to medicate their child the day before. It isolates incentive toys, such as the spinner and whistle in a separate branch to the standard inhalation circuit, placing them outside the expiratory valve of the spacer to avoid problems of contamination and interference of drug delivery. The design of the toys themselves ensures sufficient inspiratory resistance to minimise entrainment of inspired air through the toy circuit. The design attempts to link the optimal function of the toys to deep breathing pattern conducive to effective medication. The design anticipates the potential for boredom of children with particular incentive toys in its modular arrangement which would allow the replacement of the incentive toy module with a range of different toys. The use of the Funhaler lead to a statistically significant increase in adherence to asthma medication. Improved adherence, combined with satisfactory delivery characteristics, suggest that the Funhaler may be useful for management of young asthmatics. The use of the Funaler could possibly be translated to improved measures of clinical outcome. Behaviourist techniques, such as operant conditioning can be used to increase children’s adherence to medication. – Demand Characteristics and Social Desirability – the nature of this experiment and the involvement of the parents suggests that just participating in this study may have lead parents to increase their children’s adherence to their asthma medication in order to not appear bad or neglectful parents. – Generalisability – the small specific sample of Austrialian Asthmatic Children and the specific nature of the treatment, makes the results of this study difficult to generalise to other populations and adherence to other medication. + Usefulness – despite the lack of generalisability of the study, the study is useful because it suggests that behaviourist techniques can be used to enhance adherence to medical regimes, however, more research is needed to confirm this. + Internal Validity – The study has clearly defined variables, which were clearly measured. + Ecological Validity – the task which the children had to complete was simple and was close to real life, given that it was conducted in their homes, in some cases by their parents. Revision materials for Chaney et al., (2004) into adherence to asthma medication, which you will need for your OCR H167 and H567 Psychology A Level exams.